Hot dog buns don't have to go to waste when you find yourself with a few left over. With a little creative thinking, you can put them to good use in other recipes and dishes. 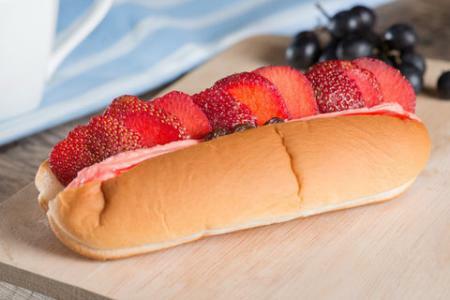 The best sandwiches add a hint of sweetness and a hot dog bun makes a great delivery system. Tailor the overall flavors by what you have in the fridge. This is a versatile recipe; it'll make as many as you have leftover if you include a few types of fruit. Spread grape jelly on one side of the bun and peanut butter on the other. Peel a banana and place it in the center of the bun. Add chopped nectarines and peaches to top off the sandwich. Blend 1/2 cup strawberries and fold them into whipped cream. Pipe whipped cream onto one side of the hot dog bun. Slice two strawberries and place on the other side of the bun. Add a few raisins (optional). 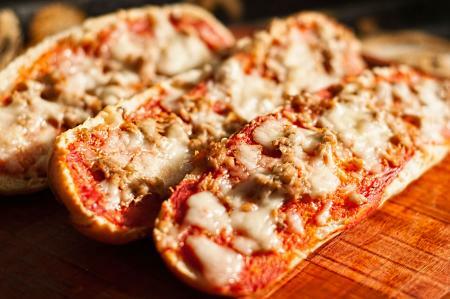 Pizza "boats" are a no-fail recipe that everyone loves. You can make two boats from one bun. Turn the broiler on in your oven. Open the hot dog buns and separate the sides. Place on a cookie or baking sheet. Spread the pizza sauce over the open bun halves. Sprinkle cheese on top of the buns. Place in broiler until the cheese is melted and bubbly. This may take anywhere from 3 to 10 minutes, depending on your oven and the amount of cheese on each half. Stay close to the oven to make sure you don't burn the boats. Croutons are a delicious topper for salads that you can easily make out of hot dog buns instead of French bread. Depending on the size of croutons you cut, you can likely get at least a dozen out of one leftover bun. You'll want to have at least three to six leftover buns; the fewer buns used, the stronger the crouton flavor. Put cut buns into a large bowl that comes with a lid. Whisk onion powder, garlic powder, parsley, salt, and pepper until well combined. Pour seasoning mix over the buns, add the lid, and give it a few good shakes. Drizzle olive oil over the top. Start with one tablespoon; cover the bowl with the lid and shake. Open to assess whether another tablespoon is needed to coat the croutons. Continue until all the croutons are coated. 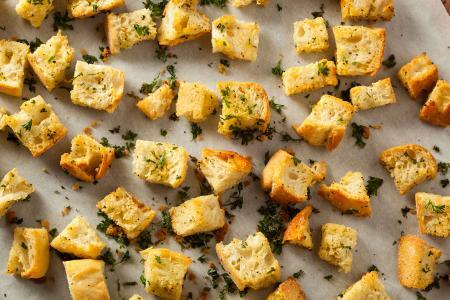 Spread in a single layer on a cookie sheet and bake approximately 10 minutes or until the croutons are dried and toasted. 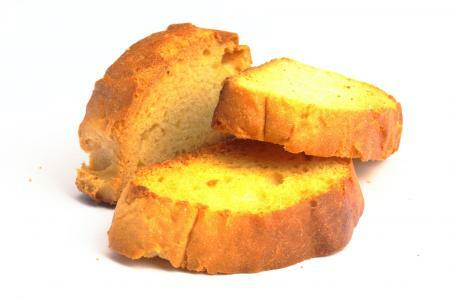 Zwieback is a German recipe that involves baking bread with a sweetened mixture of sugar and butter. While some recipes include eggs, this one is done with just butter and sugar, low and slow in the oven. It's the perfect recipe for uncut hot dog buns. You should get at least six pieces per leftover bun. This recipe should cover three to four buns, depending on how well they absorb the butter. Set oven to 200 or 250 degrees Fahrenheit (your lowest setting above warm). Mix the butter and white sugar thoroughly. Use a fork to immerse each bun fully in the butter/sugar mixture. Lay each one on parchment paper spread on a cookie or baking pan. Do not crowd the slices; leave at least ½" of space between them. Put them into the oven for 4 to 8 hours. They are ready when the pieces are crisp and hard. You'll want to watch your oven the first time you make this so you know how long it takes at your lowest setting. 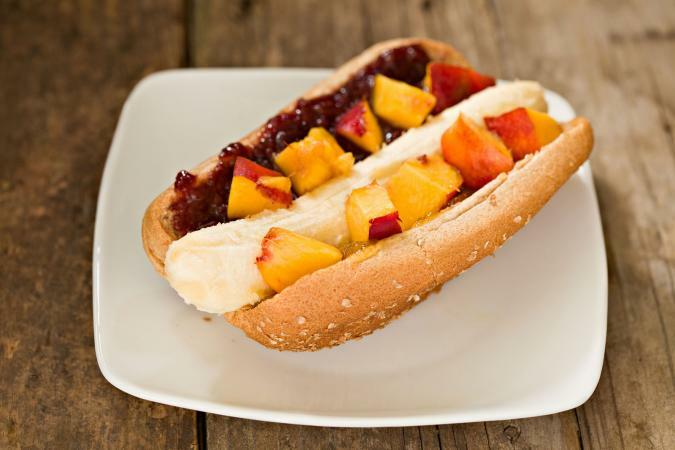 You don't need a special recipe to use up your leftover hot dog buns. Instead, substitute for bread in a variety of recipes and dishes. Line the bottom of a meatloaf dish with leftover buns to absorb excess grease and liquids. Substitute hot dog buns for bread in bread pudding dishes. Make any of your favorite sandwich recipes but use a hot dog bun instead. Toss cubed buns into egg breakfast casseroles for brunch. Cut the buns into small squares for dipping into fondue. Swap the buns for bread cubes in stuffing recipes for the holidays. Cut each bun into quarters and use as the base for Italian bruschetta. Even when you're out of hot dogs, the buns can still be put to use in delicious recipes. No matter what type of food you enjoy making, from savory to sweet, these buns are useful in numerous recipes.